Background Breast cancer familial risk clinics offer screening and preventive strategies. While BRCA1/BRCA2 genetic testing provides important risk information for some women, panels of more common breast cancer risk genetic variants may have relevance to greater numbers of women with familial risk. Methods Three polygenic risk scores (PRS) based on 18 SNPs were investigated in a case–control study of women attending a familial risk clinic. PRS were derived from published general European population allele ORs and frequencies (18-SNPs (SNP18)). In women with BRCA1/BRCA2 mutations, 3 SNPs/13 SNPs, respectively, generated the PRS estimates. In total, 364 incident breast cancer cases (112 with BRCA1/2 mutations) were matched with 1605 controls (691 BRCA1/2) by age last mammogram and BRCA1/2 genetic test result. 87 women with cancer before attendance were also considered. Logistic regression was used to measure PRS performance through ORs per IQR and calibration of the observed to expected (O/E) logarithm relative risk when unadjusted and adjusted for phenotypic risk factors assessed by the Tyrer-Cuzick (TC) model. Results SNP18 was predictive for non-carriers of BRCA1/2 mutations (IQR OR 1.55, 95% CI 1.29 to 1.87, O/E 96%). Findings were unaffected by adjustment from TC (IQR OR 1.56, 95% CI 1.29 to 1.89) or when prior cancers were included (IQR OR 1.55, 95% CI 1.30 to 1.87). There was some evidence to support polygenic scores with weights for individuals with BRCA1/2 mutations (BRCA1 IQR OR 1.44, 95% CI 1.17 to 1.76; BRCA2 IQ OR 1.44, 95% CI 0.90 to 2.31). Conclusions PRS may be used to refine risk assessment for women at increased familial risk who test negative/have low likelihood of BRCA1/2 mutations. They may alter the recommended prevention strategy for many women attending family history clinics. The objective of this study was to assess the utility of polygenic risk scores (PRS) in a familial screening clinic, with subdivision of women into those with and without BRCA1 or BRCA2 mutations. We tested the hypothesis that the individual’s SNP risk scores, generated from data from previous overview studies, combine independently for women at an elevated risk of breast cancer due to their family history. A case–control study was designed to assess the predictive value of a combined SNP panel in women at increased risk of breast cancer due to their family history. Women with a family history of the disease attending the Genesis Prevention Centre in South Manchester for risk assessment and breast screening between 1987 and 2014 were recruited to a family history clinic. All breast cancers that occurred after entry to this clinic between 1987 and March 2014 were identified (first in June 1990), in addition to those previously diagnosed with breast cancer before they entered the clinic. Women with breast cancer and cancer-free controls were contacted between November 2010 and October 2013 to obtain informed consent and to provide a blood sample for DNA extraction if not already available. Of the 75 deceased cases, DNA was stored from 49 and consent was not required. Blood samples were taken from all women from which DNA was extracted, or pre-existing DNA samples (also previously extracted from blood) were used. BRCA1/2 mutation testing was carried out when clinically indicated (the prior probability of identifying a mutation must have met the threshold of BRCA1/2 likelihood probability ≥10% in accordance with UK clinical guidance,18 using the Manchester score19) using DNA Sanger sequencing and multiple ligation-dependent probe amplification analysis of all exons and intron–exon boundaries.20 Relatives of those identified with BRCA1/2 mutations were offered cascade screening for the family-specific genetic mutation. All women were genotyped for 18 SNPs that have been shown to be associated with breast cancer risk in general European populations (FGFR2, CASP8, TOX3, MAP3K, 2q, CDKN2A, 10q22, COX11, NOTCH, 11q13, 10q21, SLC4A7, 6q25.1, 8q24, RAD51L1, LSP1, 5p12, 10q) as previously described.17 In brief, multiplex genotyping was performed using Sequenom iPlex Gold (Sequenom, San Diego, California, USA) and TaqMan assay (Life Technologies). Intra-plate duplicates and negative controls were included in all genotyping. Genotypes were verified by Scientific Data Systems (SDS) and MassARRAY TyperAnalyzer software. The primary end point was diagnosis of invasive breast cancer or ductal carcinoma in situ. Diagnosis of breast cancer was confirmed by hospital records or the North West Cancer Intelligence Service. Case–control matching was by age at last mammogram (±1 year) and BRCA1/2 genetic test result. Controls were ineligible if they did not attend the clinic during the period of recruitment. Individuals without breast cancer, but with a BRCA1/2 mutation (BRCA1/2 controls) were matched as available, and 3–5 controls for individuals without BRCA1/2 mutations (table 2). The reason for matching cases and controls on age at mammogram was to ensure that an age when disease-free and at risk of breast cancer was balanced between cases and controls. Dates of last follow-up were either date of breast cancer diagnosis or date the woman was last in contact with the risk clinic or other National Health Service (NHS) service, the date of risk-reducing mastectomy or of death. A polygenic score was used to provide an overall relative risk estimate. We calculated the OR for each of the three SNP genotypes (no risk alleles, one risk allele and two risk alleles) from published per-allele ORs, assuming independence and normalising by an assumed risk allele frequency.12 Assay failures were ignored in the SNP score by imputing a relative risk of 1.0 when they occurred. An overall SNP risk score for each woman was formed by multiplying the genotype ORs for together (table 1). Phenotypic risk was assessed using predicted 10-year risks, and over the total follow-up period, from the Tyrer-Cuzick (TC) model (V.7.02). The following information from a risk questionnaire was incorporated: age at baseline; second-degree relatives (age affected by breast and ovarian cancer or current age or age at death); age at first child, menarche and menopause; height and weight; and history of prior benign breast disease. Quality control of the assay was tested by assessing Hardy-Weinberg equilibrium (HWE) for each SNP by comparing the observed number of homozygotes against expected assuming independence and by concordance between duplicate samples. Phenotypic risk factors at entry in the non-BRCA1/2 mutation cases and controls and the complete cohort to 2014 were tabulated. A Wilcoxon rank-sum test was used for differences in age at entry for cases and controls. Analysis was stratified by BRCA1/2 testing groups (positive or not). The main test statistic was a univariate likelihood ratio (LR) χ2 (df=1) for the risk associated with the log PRS. ORs were estimated by logistic regression and CIs by profile likelihood. In non-BRCA1/2 carriers and prospective cases, the model also included the logarithm absolute risk from the TC model over the follow-up period for each woman. The Spearman correlation was calculated between TC 10-year risk and SNP18 in controls. Unadjusted area under the receiver operating curve (AUC) was used as a secondary measure of discrimination with DeLong CIs.21 CIs for observed divided by expected proportions used Wilson's method for the binomial parameter. The change in lifetime risk categories calculated by lifetables (Manchester method19 ,22 ,23) was assessed. They were chosen to be relevant to UK National Institute for Health and Care Excellence (NICE) guidelines18 of average 8–16%, moderately high 17–29%, high 30–39% and very high 40%+, and US MRI guidelines (above and below upper limit of 25%24).Analysis was carried out in GNU R V.3.1.1 (R Core Team (2014). R: A language and environment for statistical computing. R Foundation for Statistical Computing, Vienna, Austria. http://www.R-project.org/). In total, 9222 women were seen at the family history clinic between 1987 and 2012 to assess breast cancer risk and initiate screening if appropriate. Also, 489 individuals were diagnosed with breast cancer after entry to the clinic, and of these 364 (112 with BRCA1/2 mutation) were recruited to this study and provided a blood sample from which DNA was extracted. A total of 87 women with breast cancer prior to initial clinic attendance were also recruited. In total, there were 1605 controls (691 with BRCA1/2 mutations). A summary of the composition of the sample separated by BRCA1/2 testing status (individual and family) is shown in table 2. In the case–control study, there were 16 832 years of follow-up (median 7.9 years) from recruitment to the clinic to the last follow-up or breast cancer. The median year of entry to the clinic for the prospective cases was 1996 (IQR 1993–2002), it was 2004 (IQR 1998–2009) for controls. A comparison of the distribution of phenotypic risk factors and 10-year risk at baseline in individuals without BRCA1/2 mutations shows that the non-BRCA1/2 controls were at a slightly higher risk of breast cancer than the overall cohort, being older and with a more substantial family history of the disease (table 3). The non-BRCA1/2 controls were also younger at entry than non-BRCA1/2 cases (p<0.001). The BRCA1/2 cases and controls had a similar age at entry (controls: median 39, IQR 32–46; cases: 37, 33–45; p=0.3). Quality control of the genotyping was satisfactory: the call rate for each SNP was >98%, and HWE was verified separately by BRCA1/2 mutation group (see online supplementary material). SNP18 in the group without BRCA1/2 mutations was a significant predictive risk factor (LR χ2 22.7, p<0.001, table 4), with an IQR OR of 1.55 (95% CI 1.30 to 1.87) and AUC 0.59 (0.55 to 0.63). Findings were similar when non-prospective cases were excluded. SNP18 was not correlated with TC 10-year risks (Spearman correlation 0.01 in controls, p=0.7) and was predictive when adjusted for TC risk over the period from entry to last follow-up (IQR OR 1.56, 95% CI 1.29 to 1.89). SNP scores in the BRCA1/2 mutation-positive groups suggested that they might refine risk, but analysis was limited by sample size and the strength of the predictor. Figure 1A plots histograms of SNP18 in cases and controls without BRCA1/2 mutations. Analysis of SNP18 by quintiles is shown in table 5. There was more than a twofold higher risk between the bottom and top quintiles of SNP18 in women without BRCA1/2 mutations. The observed risk was also close to expected, being 96% (95% CI 56% to 136%) of expected in the complete data. This excellent calibration is further illustrated in figure 1B, C. The predicted risk was 100% (95% CI 57% to 142%) of expected after adjustment for risk from classical factors. Results for non-BRCA1/2 group. (A) A histogram of SNP18 in controls and prospective cases; then the observed versus expected OR is plotted in (B) for prospective cases and (C) all cases. In (B) and (C), the points (o) are observed and expected in each decile, the solid line (—) is from a logistic regression fit to the individual-level data, the dashed line is the 45° diagonal. E, expected number of cases; O, number of cases. A substantial proportion of the unaffected women without BRCA1/2 mutations moved between clinically relevant lifetime risk categories if an unadjusted PRS was used. Of the 914 controls who did not test positive for BRCA1/2 mutation, 475 (52%) moved category with 432 (25%) moving up a category and 443 (27%) moving down. Using a 25% lifetime risk threshold, 32/174 (18%) moved up into this category, whereas 149/740 (20%) moved down from this category. SNP18 was predictive of breast cancer risk for women who did not test positive for BRCA1/2 mutations as observed risks were very close to expected. Findings were unaffected by adjustment from the TC model based on classical phenotypic risk factors or when prior cancers were included. Polygenic scores for women with BRCA1/2 mutations were also informative, although analysis was limited by sample size and strength of these predictors. Our data suggest that PRS may be used to refine risk assessment for women already at increased familial risk without BRCA1/2 mutations. PRS are likely to have a substantial impact on prevention strategies recommended for a woman based on her lifetime risk estimate. Our study has several limitations. First, those who consented to join the study as controls were at a higher risk than the overall cohort. This meant that we were unable to assess how much the SNP score added in comparison with the TC model. However, there was no association between the PRS and risk from the TC model, and findings were unchanged after adjustment for phenotypic risk. Second, not all of the groups defined as without BRCA1/2 mutations had been tested for BRCA1/2 and therefore will include a number of individuals with mutations. This number will be small as all were below the NHS testing threshold of 10% a priori risk of mutation detection in England and Wales.18 Among the 124 untested prospective breast cancers, we estimate no more than 5% would harbour a BRCA1/2 mutation based on Manchester score; approximately six women. Among the untested unaffected women, we would assess an even smaller proportion may harbour BRCA1/2 mutations. As such, this should have a very small effect on our results. Finally, we note that many of the BRCA1 cohort were part of the EMBRACE project and were therefore used (with many other samples) to estimate the ORs for BRCA1 carriers through CIMBA. Analysis excluding these is very limited, and there are only eight BRCA1 controls. However, the results (see online supplementary material) at least show that ORs are in the correct direction for those who were not part of EMBRACE. The predicted risk of SNP18 matched the observed risk and also held true after adjustment for risk from classical factors. This has important implications for provision of breast cancer risk information in clinics similar to the one in this study because it suggests that SNP scores can be used to refine risks in women already at increased risk from their family history. If women without breast cancer are undergoing genetic testing for BRCA1 and BRCA2 mutations either as stand-alone tests or as part of a panel, use of multiple SNP testing could be considered at the same time. The great majority of women tested for BRCA1/2 receive a negative ‘uninformative’ results, which in most instances will only slightly reduce their predicted risk of breast cancer. For these women, an SNP PRS would provide a more meaningful result once BRCA1 and BRCA2 mutations have been excluded. Use of SNP18 PRS resulted in over half of women changing a NICE-defined risk category. A substantial proportion of (18–20%) of women in our familial risk clinic also crossed the upper 25% lifetime risk boundary used in North America24 to determine eligibility for MRI screening. It is likely that use of a PRS may have more added value than extended gene mutation panel tests of moderate and highly penetrant genes. In a study of 198 women referred for BRCA1/2 testing, 57 (29%) harboured pathogenic mutations in BRCA1/2.25 A further 16 had what were classified as pathogenic mutations in the extended panel of 42 genes. However, the concept of what were ‘actionable’ (identifies pathogenic mutations in genes that substantially affect risk) mutations is debatable, especially when restricted to breast cancer. Only three women (2%) without a BRCA1/2 mutation had a really useful result from the extended panel test. In contrast, an SNP PRS would provide an adjusted overall risk for all women testing negative for BRCA1/2 mutations. There is supporting evidence that our results may generalise to other settings. 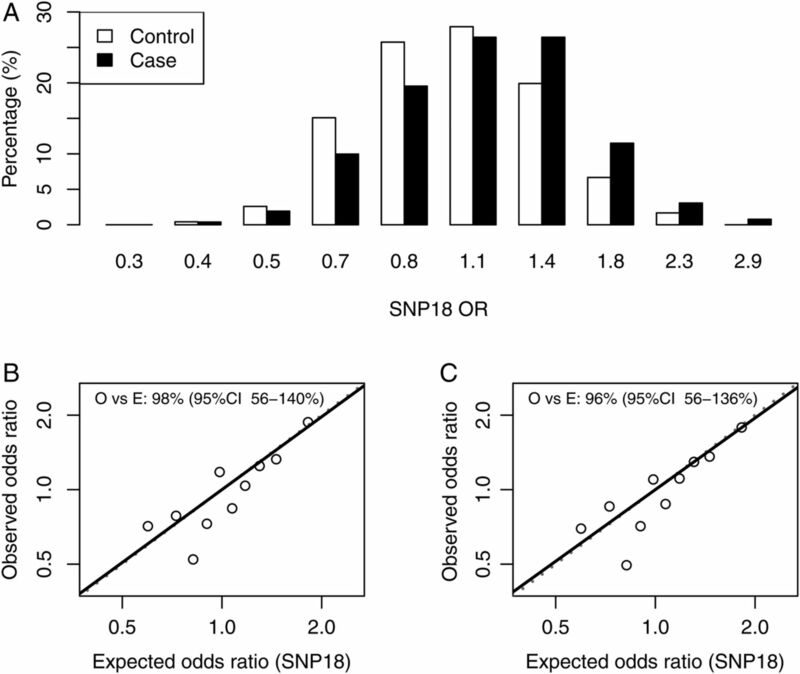 Importantly, our analysis used predefined SNP ORs from large case–control studies of the general population:13 ,26 SNP risks were not calibrated to this case–control study. A further study from the Australian Family registry also showed that using an SNP PRS derived from these estimates added significantly to the prediction from risk algorithms including Breast and Ovarian Analysis of Disease Incidence and Carrier Estimation Algorithm (BOADICEA), BRCAPRO and TC,27 although the observed risk appeared to be less than expected. In terms of BRCA1/2 carriers, many of the SNPs have not been shown to add value for risk assessment. For women with BRCA1 mutations, only three SNPs add value,14 ,15 which is not surprising because the majority of cancers in this patient group are oestrogen receptor negative (whereas most of the SNP18 variants are associated with oestrogen receptor-positive breast cancer). Our data support the previous GWAS studies that suggest for an accurate risk for BRCA1/2 a different weighting is required for each SNP than that applied to the general population. The prediction in table 4 shows that SNP18 with iCOGS weightings for BRCA1 has a non-significant prediction that improved by using just the three SNPs validated with CIMBA weightings. Similarly, although there was partial prediction in BRCA2 carriers from SNP18, this improved by using CIMBA BRCA2 weightings. We have previously used BRCA1 weightings in three SNPs validated for a BRCA1 (mutation-positive group14 ,15). A data set of 462 BRCA1 carriers with 269 cancers showed no validity for the three SNPs.17 The results for SNP3 in BRCA1 carriers in the present data set were driven by rs3757318 in ESR1. The individual effect for this SNP was larger than expected (see online supplementary material). In summary, the current study provides evidence for utility of using a selected panel of risk-associated SNPs in the familial risk clinic in non-BRCA1/2 mutation carriers to refine risk estimations.26 ,28 We advise using the iCOGS weightings in women at high risk of a BRCA1/2 mutation only if BRCA1/2 testing has already been undertaken and has proven negative or is undertaken at the same time. If women test positive for a BRCA1 or BRCA2 mutation, then different algorithms are needed if an SNP risk prediction element is to be used to refine their risk estimate. The authors thank Dr Antonis Antoniou for his help in obtaining BRCA1 and BRCA2 SNP weightings. Cancer Research UK. http://www.cancerresearchuk.org/cancer-info/cancerstats/incidence/commoncancers/ (accessed Feb 2016).
. Genetic analysis of breast cancer in the cancer and steroid hormone study. Am J Hum Genet 1991;48:232–42. http://www.cancer.org/cancer/breastcancer/moreinformation/breastcancerearlydetection/breast-cancer-early-detection-acs-recs (accessed 23 Jun 2016). Collaborators FH-Risk Study Group: Susan Astley, Mary Wilson, David French, Michelle Harvie, Donna Watterson, Paula Stavrinos, Jill Fox, Sarah Sampson, Sarah Ingham, Sarah Sahin, Lynne Fox. Contributors DGE and AB are joint first authors. Conception: DGE, AH and JC. Data acquisition: HB, PS and DGE. Data analysis: AB, JC, DGE and EH. Manuscript writing: all. Approval of final version: all. Funding The study received grant support from the NIHR and the Genesis Breast Cancer Prevention Appeal. This paper presents independent research funded by the National Institute for Health Research (NIHR) under its Programme Grants for Applied Research (Reference Number RP-PG-0707-10031). Competing interests DGE has received a one-off consultancy fee from Astazeneca. DGE is an NIHR senior investigator. Ethics approval NHS North Manchester Research Committee (08/H1006/77) and University of Manchester ethics committees (08229). Data sharing statement Data in this article can be shared on request.